Where Danger Lives (RKO, 1950). Folded, Fine/Very Fine. Half Sheet (22" X 28") Style B. Film Noir. Starring Robert Mitchum, Faith Domergue, Claude Rains, Maureen O'Sullivan, Charles Kemper, Ralph Dumke, Billy House, Harry Shannon, Philip Van Zandt, Jack Kelly, and Lillian West. Directed by John Farrow. 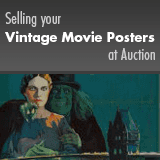 An unrestored poster that displays signs of use including light edge and fold wear, creases, small tears, surface scuffs, stains, or smudges. Folded, Fine/Very Fine.